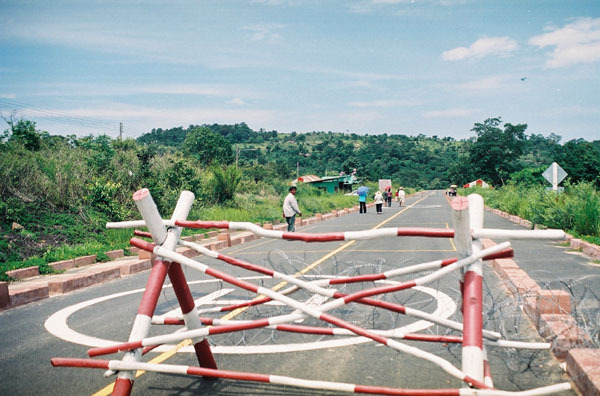 The Thai checkpoint before entering Cambodia was surrounded by a barbed wire barricade and a military outpost complete with soldiers on duty in their dugouts. 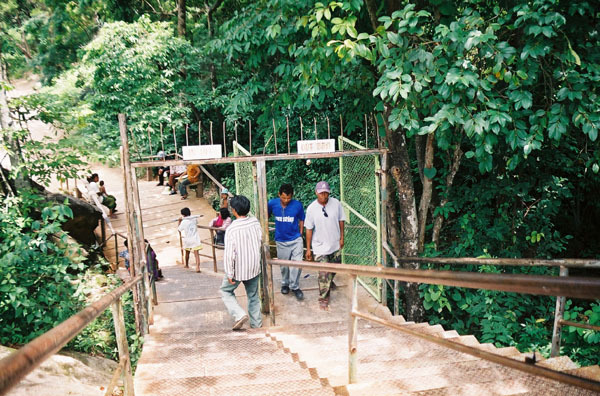 The area did not seem to require such a presence of fortification and certainly was a reminder that this was not a normal customs crossing but an entry point to a temple in Cambodia accessed only on foot. 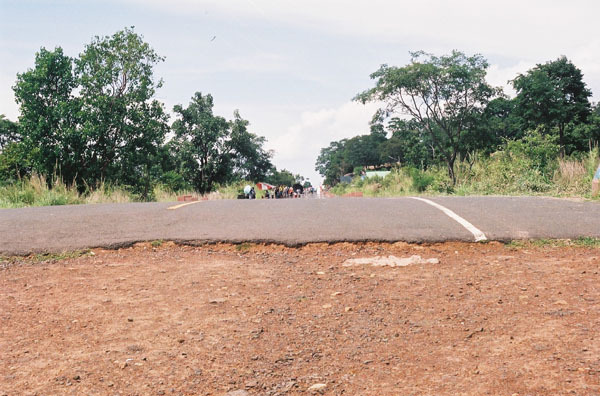 The road from Thailand literally ends and you must walk on sandstone without any decernible path but only a general direction down a hill where you are assuming is where the entrance to Cambodia lies. It was a very odd feeling for all at once the road no longer existed and you were left standing alone on a ridge of sandstone knowing you were on your way to a temple and at the same time feeling outside of everything that was familiar. It felt like the proverbial "no man's land". When you looked back towards Thailand all you could see was the end of the pavement, and when you turned to look at Cambodia all you could see were hills and sandstone ridges. In an instance I felt completely removed from any sense of familiarity and I could feel what it must of been like long ago where everywhere you looked was the natural surroundings but without border garrisons or tourists. 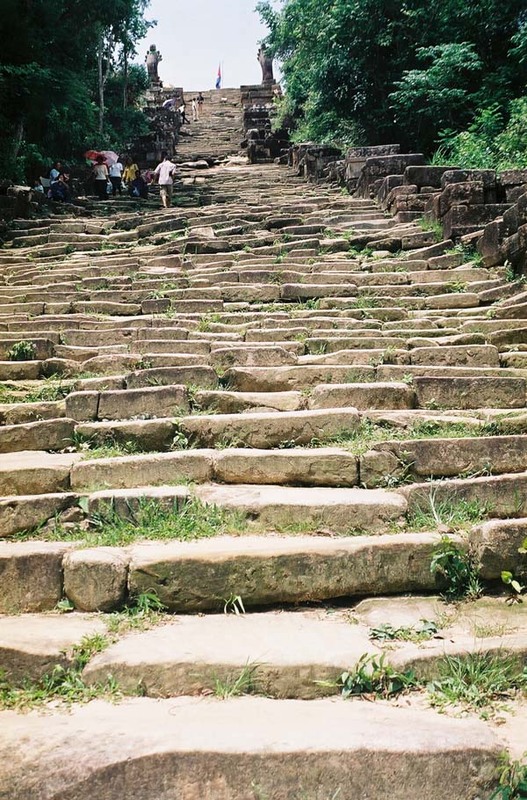 After that brief moment of being transported back in time I began walking down the sandstone plateau when the Cambodian border came into view with a metal staircase and gate which would lead me to Preah Vihear. Before approaching the entrance to Preah Vihear, however, I found myself walking through a shanty town which is home to all the vendors that stalk the tourists. 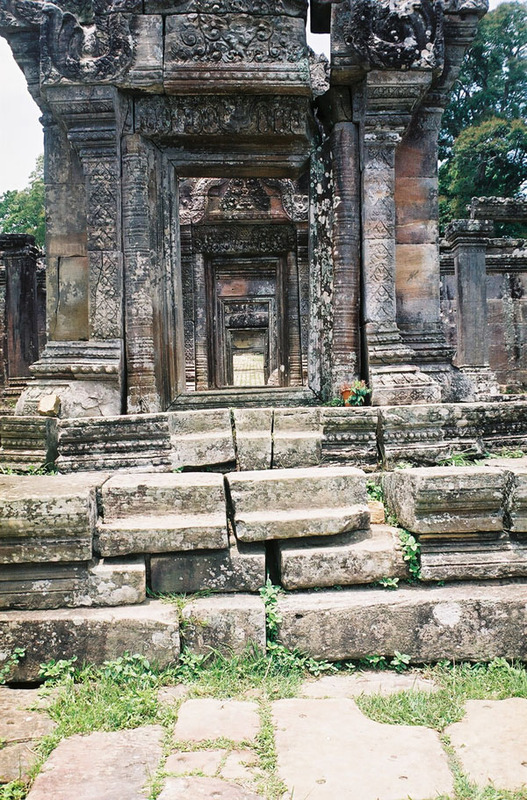 Once through the shanty town I finally approached the entrance to Preah Vihear. I was stunned. It was a magnificant sight. But it was also at the beginning of this staircase that I got my first rude introduction on how the reality of the ancient past is fused with that of our modern world. A lion on the staircase greeted me as I began my ascent to the abode of the gods, and the naga heads were waiting for me at the top of the stairs, but no sooner had I begun my cosmological journey to the sanctuary of Shiva that I became surrounded by dozens of children trying to get me to buy their postcards. My momentary trance of going back in time was shattered and I found myself politely trying to fend off the children. Their persistence was annoying as I found them following me quite a distance up the temple staircase or approaching me when I least expected it. 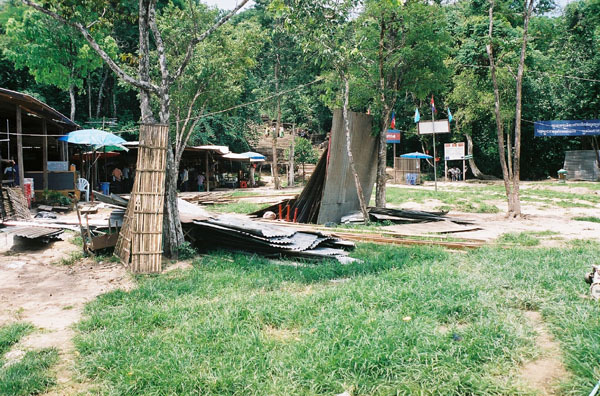 As an early 21st century pilgrim to Preah Vihear it was evident to me how old and badly damaged the temple really was. Stone pillars holding up temple walls had fallen and the courtyards were covered with weeds and rubbish left behind by the countless thousands of tourists who visit weekly. Vendors could be seen and heard selling everything from softdrinks to electronic toys with their incessant squeaking and squawking drifting throughout the sacred sanctuary enclosures. Unchecked vendors setting up their stalls are sadly smothering the solemnity, which is written about by so many authors on the intent of the Kings who built Preah Vihear. 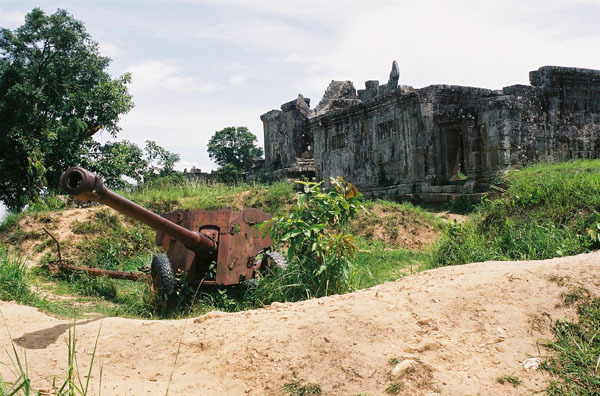 At Preah Vihear you can witness both the vestiges of Pol Pot's Khmer Rouge who made the sanctuary their last stronghold until 1998 as well as the ancient lion sentinels over looking the Korat plateau in Thailand. It seems hauntingly peculiar to see military hardware and bright red signs with skull and cross bones sharing the same ground with the temple. Furthermore it is even more difficult to accept or understand why such a magnificent temple dedicated to devotion and worship would have to suffer the ravages and rapaciousness of humankind. There is no question that Shiva the destroyer and restorer are both poignantly represented at Preah Vihear. 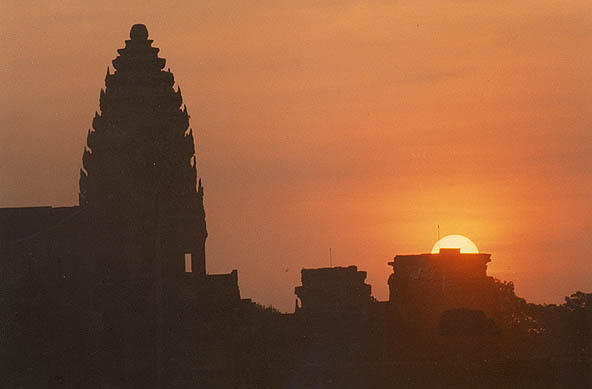 But the heat of the day combined with my own determination to see the sacred enclosures and temple grounds dominated my thinking and I was able to drift into my own world of exploration and discovery and escape from the profane reminders of Cambodia's recent tragedies. I knew from what I could see before me that this was no ordinary temple. This was the pinnacle of expression of an architectural sanctuary devoted to Shiva which was under construction by a succession of kings for many centuries. 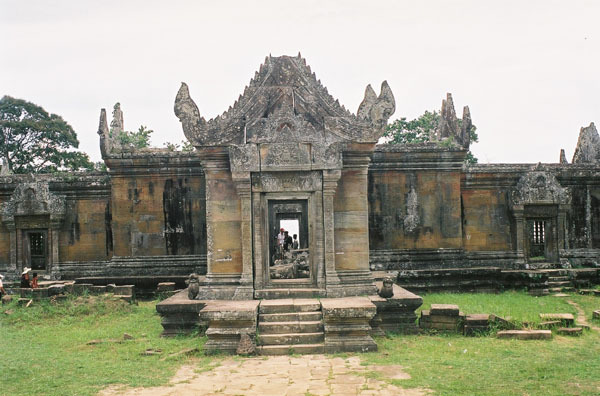 Preah Vihear was a center for worship and scholarship for the entire Khmer kingdom, Chinese emassaries, Indian Brahmins, and perhaps even representatives from the Mayan civilization in Central America. 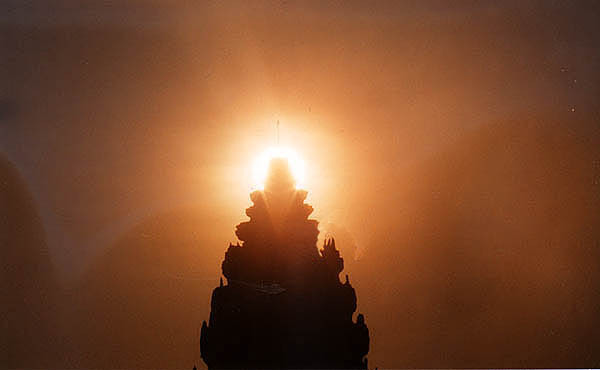 "The increasing larger temples built by the Khmer Kings continued to function as the locus of the devotion to the Devaraja, and were at the same time earthly and symbolic representations of mythical Mt. Meru, the cosmological home of the Hindu gods and the axis of the world-system". 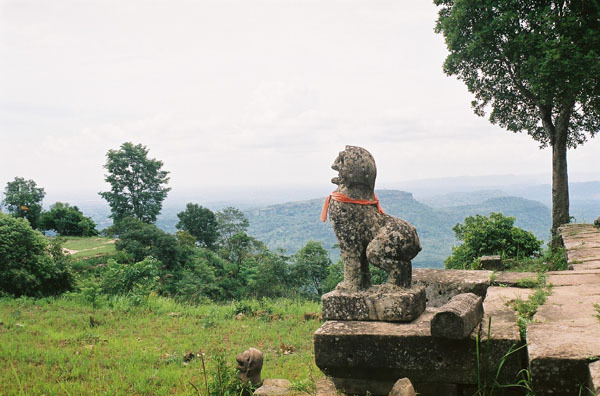 Preah Vihear definitely was planned as a symbolic representation of Mt. 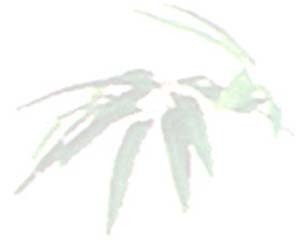 Meru, and all the sacred numbers defining astronomical configurations were yet to be fully uncovered on this sacred ground. 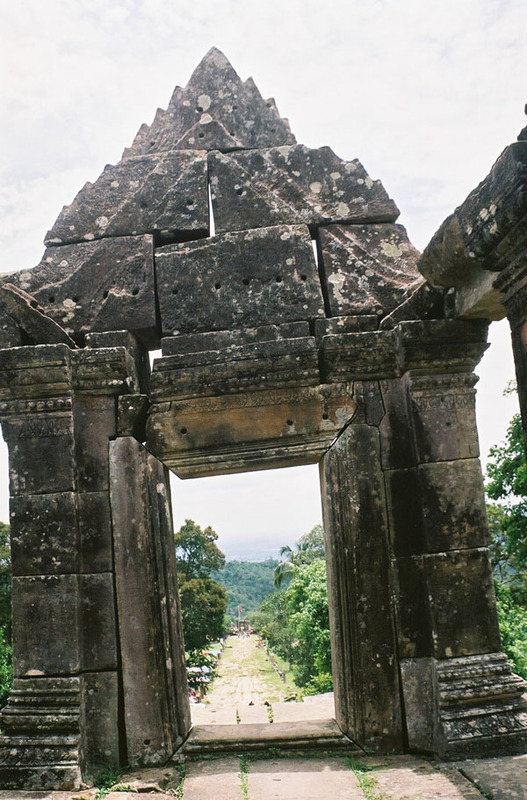 But I knew the plan of the heavens lie before me and depending on which direction I walked inside Preah Vihear would provide me with an insight which just might catapult me back in time. 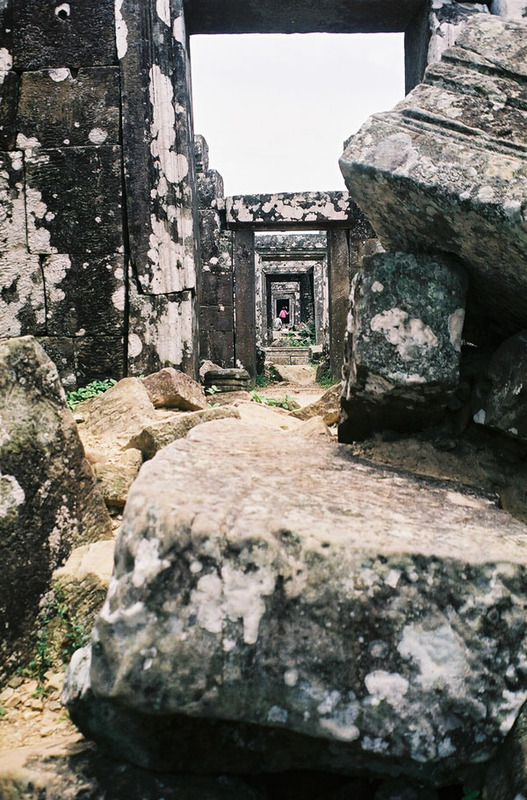 Depending on which direction you walk inside Preah Vihear will determine which room, hall or courtyard may catapult you back in time. No longer were their draperies of fine silks, finely carved wood furniture, or gold ornamentations, but only open roofs and empty stone rooms covered with lichen. Strewn on the temple grounds were the remains of exquisite artisan stone work, and above the doorways there were still a few remaining lintels with carvings depicting the mythology of the Hindu Gods. The deterioriation of this stone art work is more than evident. Many of the lintels have been removed and what remains is only a skeletal framework of this once magnificent sanctuary. Many of the lintels still capture the essence of this Hindu temple. The churning of the milky ocean, Shiva embracing his wife Uma, and Vishnu on top of Kala are some of the better examples still left at Preah Vihear. The lintels and stone carvings lend a powerful reminder of the devotion and splendor that graced all the walls and doorways long ago. 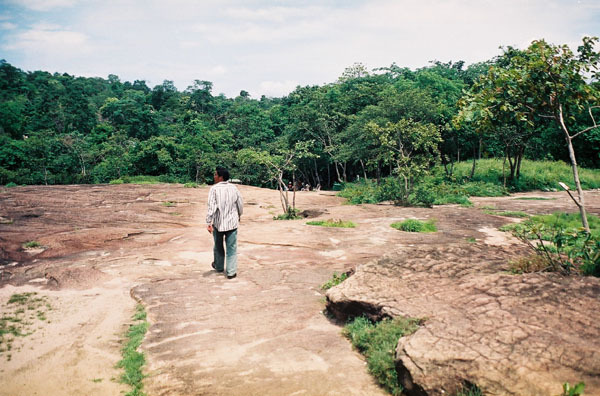 I allowed myself to be carried along by these images as I climbed even further until I reached the fourth level; the top most part of Preah Vihear where the central sanctuary with the Bhavalai touches the clouds hovering over the mountain. 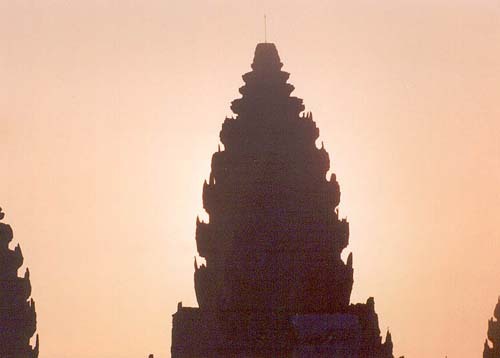 Other stories related to the Khmer Empire. 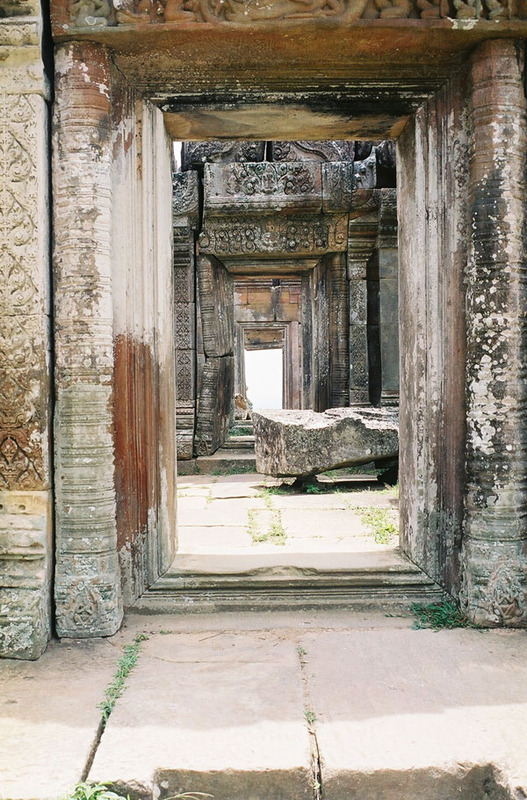 Part II - Stones in the Sky - Journey to Angkor Wat - July 2002. Part III - Stones in the Sky - Section I - Journey to Angkor Wat - March 2003. Part III - Stones in the Sky - Section II - Journey to Angkor Wat - March 2003. Part V - Stones in the Sky - Journey to Beng Mealea - October 2004. Center for Archaeoastronomy and ISAAC, the International Society for Archaeoastronomy and Astronomy in Culture.